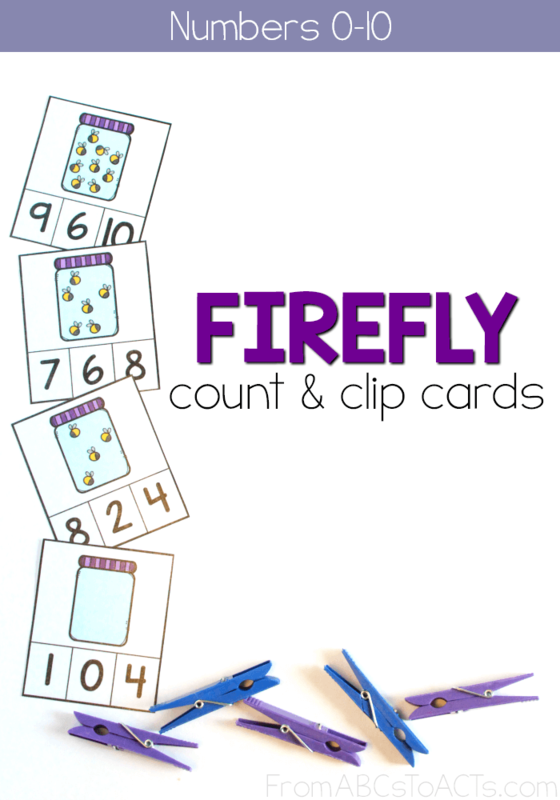 These firefly count and clip cards are the perfect way to practice counting with your preschooler during the warmer months of the year. One of our favorite Summer activities is heading outside as it starts to get dark to catch fireflies. My oldest especially has become quite the expert at catching them with a mason jar so that he can watch them light up for a few minutes before letting them go. For the past several days though, it’s done nothing but storm and our time outside has been cut back a bit. But, as the back to school season draws closer, we’re trying our best to hold onto the last few weeks of Summer vacation and these printable count and clip cards are the perfect way to celebrate the creatures responsible for nature’s nighttime light show. Once again, we broke out our fun colored clothespins for this Summer themed counting practice activity and just like out watermelon version, these cards not only allow your child to work on their fine motor skills, but also their number recognition and hand-eye coordination as well. This printable set includes numbers 0-10 and once you laminate them for durability, you’ll be able to use them as a preschool or kindergarten math center for years to come! Stick the cards and the clothespins into a zippered pencil pouch and you’ve got a portable busy bag that makes a fantastic car activity. Of course, once you’re done with these, head on over to our shop and grab the Endless Clip Card Bundle. You’ll get every single clip card set we ever create in one convenient location!